Nobody's going to let me race an actual F1 car, but I did get to experience the UK's most realistic F1 experience outside of a Jenson Button first-lap retirement. My team for the day: Let's Race. So… let's race! So, what the actual heck is this? The reveal, when it comes, is expertly stage managed and executed. Following a video safety briefing by racing gramps Martin Brundle that's 50% cheesy corporate video and 50% educational tips, we're directed into the sims room. It is jaw-droppingly great. Here sit 10 replica F1 cars worth over £130,000 apiece, laid out menacingly in two rows of five in a room as cold as a fridge and as hushed as a church. Or a fridge. This is a sweet million pounds-worth plus of serious tech, and it is beautiful. We're at Let's Race, the UK's only full motion F1 car simulator, set on an unassuming crossing that clearly used to be a car dealership or service station, an angry llama spit from Gatwick airport. It's owned and operated by racing team Carlin and alongside training their drivers – and anyone else with some ambition and the requisite cash – it's open to any members of the public who want to get as close as humanly, and technologically, possible to an F1 experience. Of course, it's a stag weekend and corporate bonding dream. Let's Race can incorporate your company logo into advertising billboards and hoardings. Offering 10 F1 car simulacrums that you and nine chums can race against simultaneously, is almost worth getting hitched to have a pop. Almost. There are three choices: Premium Race Experience (15 minute qualifying, 30 minute race), Race Experience (15 minute qualifying, 15 minute race) and Practice (essentially a 25-minute straight blast). Plus, jump in/jump out endurance races are also available. Today we're laying virtual rubber onto the Circuit Gilles Villeneuve track at the Canadian Grand Prix, as we're told it's a good introductory course with fun straights and not too many complicated turns to master and/or stuff up. All current F1 tracks are available. Then following the aforementioned briefing, we're led into the church-like inner sanctum and introduced to the cars. This is an exact simulacrum of an F1 car. And their pilots, for reasons which became immediately apparent, appear to be juice-dieting munchkins. Just getting into the car is a multi-part exercise in contortionism as you sit on seat, jam legs in, wriggle bum down, jam legs further in. It's snug, for sure, but that's all part of the experience. As the seat is integral to the car's frame, a button pulls the two pedals near or far, depending on leg length and the steering wheel clicks into place, like a real F1 car. The system judderingly calibrates, the three screens fire up and you're counting down to 15 minutes of qualifying. A grandstand behind projects your racing onto the 50ft front wall, so anyone can see your “heroics”. My qualifying must have made for uncomfortable viewing, however as, predictably, I'm utterly risible. Swapping ends more times than a dodgeball tournament, it feels like every time I hit the brakes, the car dances like the tyres are buttered and I keep forgetting to change up on the flappy paddle gears, even though the F1-style light system is lit up like a nuclear plant in melt-down. I'm soon lapped by my lunchtime pilot partner. Then lapped again. It's frustrating. It's difficult. But glory be! This is fun. And try telling your body this is just a sim. It's completely, totally immersive, and I can feel what it's doing to me, physically. Adrenaline flies around like I've been fuel injected, I can feel my heart rate peaking like I'm running up the Shard's stairs and my concentration feels almost painfully intense. So much so that the preliminary “practice” session is over in about five minutes flat. We look accusingly at our man from the company who swears blind we've had a quarter of an hour. This is a common reaction, it turns out. The racing session is so immersive and your concentration so intense that 15 minutes passes in a flash. Extracting myself is a similar pantomime of body unfolding in stages, like reverse, fat origami. Time to look over the telemetry data and get a feel for where we're going wrong. For me, it's simple. I'm using the brakes like a learner driver's first lesson, stamping them like I'm Riverdancing and losing traction immediately, hence the tail swapping and general, all round armco abuse. And I'm flatspotting like crazy, making my tyres incrementally worse. A good, manly stamp is all that's required, but it's hard, as you're simply responding to the inputs hitting our brain, with the end result being stamping the break like it'll go through the floor. My lap time is a risible 1.44min. My co-driver hits a very respectable 1.25 and the lap record at the venue is 1.16. I've got work to do. Returning to the cars, we start our 15 minute race and I'm at it again. Traction is a stranger, I'm doughnutting like I'm in a Civic in a McDonald's car park and swearing like a Scots trawlerman. But then I put together a clean lap. Then another. Then another. And finally I'm starting to feel more like an F1 driver than a milk float driver and the adrenaline-fuelled euphoria kicks in again. Then, of course, the session is over once more, we pop ourselves out of the cars like swollen zits and I can see my lap times posted up on the big screen. It's 1.39:901. Still terrible, but unquestionably an improvement. I'm on a learning curve. The sessions feel short, that's for sure, but it's purely subjective, and any longer for the inexperienced driver and nausea can become a real problem. Outside there's a fake podium where you can get snaps celebrating your drive. I gave that a miss. It just didn't feel seemly. 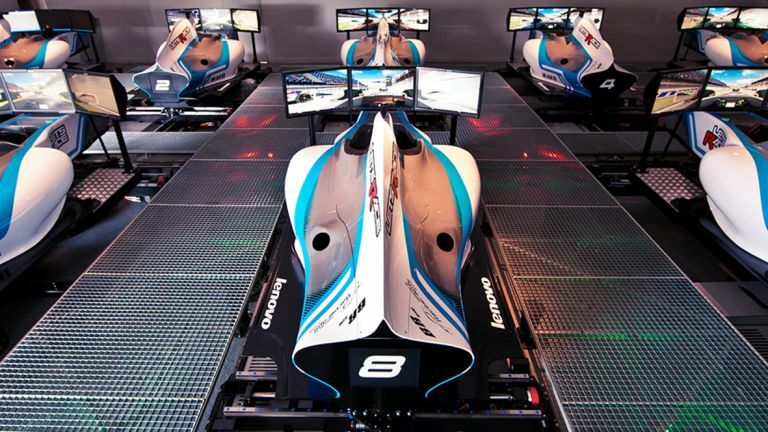 Each car sits on a huge, individual moving mechanical bed, with you squeezed into the seat, staring at three monitors all linked to deliver one, wraparound, panoramic view. I'm also told that generally the sims are dialled down by 20 per cent as any more and a particularly violent crash can have the unit break your wrist, it's so physically strong. My verdict: I'm raring to return, especially in a few month's time when Let's Race intends to upgrade the experience with the next generation, higher definition sim software RFactor2. Very soon, James tells me later, they intend to upgrade to 4K resolution on three, curved screens. That I have to see, and surely the greater realism means I'll perform better. Lewis Hamilton: you're going down. Let's Race Practice Sessions start from £15, with Race experiences from £25.